If you own commercial property it is generally thought of in a different context than your personal home. Your personal home has a gorgeous and classy landscape design, tons of flowers and a water feature. It is time to reap the rewards of your success and beautify your commercial property! 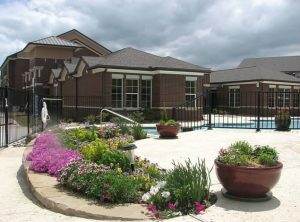 Let’s say you own a modest apartment complex that you purchased with substandard landscaping and you want to make it gorgeous again. Dr. Green Thumb is who you need to call for an inspired, beautiful landscape design. For instance, outside of the office is a flower bed that has been left to wilt in the Oklahoma City summer. We can take things like that poor, neglected flower bed and make it the jewel of your apartment complex. We are able to take existing landscaping and refurbish it into something that will make your residents proud to live there. How about property maintenance services? Yes, at Dr. Green thumb, we have partnerships with commercial building. We offer a comprehensive menu of landscape services and are very competitive in our pricing. We meet with you and discuss your goals for your property. You choose the services that you want and that is the beginning of a year-long package. Think of it, you don’t have to worry about your grounds for as long a Dr. Green Thumb is on the job. So be sure and call today for your commercial landscape maintenance package and be covered through the summer.